An astonishing blend of spectacular alpine scenery reflected in tranquil lakes, Veronas Roman remains and the medieval worlds richest city – remarkably unique Venice. For centuries, Italy has drawn visitors in search of culture and romance, with few countries comparing with its enormous classical origins, its art, architecture, music, design, scenery, food and wine. Italys contribution to European painting and sculpture surpasses that of any other nation. Blend this with the magnificent scenery of its lakes, one of the worlds great cuisines and the Italian attitude of living life to the absolute maximum, and you have a superb destination for a tour. Further north, we see the Dolomite Mountains- some of the most spectacular alpine scenery on earth. It is only in the past 150 years that Italy has come to exist as a nation state formed from a collection of largely independent cities, often separated by almost impenetrable marshes or mountain ranges. They then evolved totally independently and on this tour we shall visit two of them – the very different but very classic cities of Verona and Venice. Verona is without doubt one of the most attractive cities you will ever see and appropriately well known as the setting for the legendary story of Romeo and Juliet. It has been important since ancient times and in fact has more ancient remains than any city in Italy except Rome itself. Its most striking monument is the arena  the third largest ever built  where a range of entertainments were presented, including gladiatorial combat. Enclosed by massive and extremely well preserved ramparts, the city has a lovely medieval feel to it with pink-hued buildings, lovingly restored, lining the streets. All the photographs and pictures you have seen of St. Marks Square and Basilica, the Doges Palace and the Grand Canal have simply been telling the extraordinary truth: that Venice is a stunning city. You cannot walk for more than a few minutes without stopping to see something which demands admiration. One of the greatest joys of visiting Italy is, of course, being amongst the Italians themselves. Stylish, always ready to help and, if there is a single national characteristic, it is living life to the full, which creates a fantastic atmosphere so much in evidence everywhere  so come with us and see. You should arrive at the airport to take your flight from your selected airport. On arrival a coach will take you to the delightful lakeside resorts of either Malcesine or Riva del Garda, both beautifully surrounded by lofty peaks, situated at the more scenic north end of the lake. The rest of the day will be spent at leisure, allowing you time to settle into the hotel and start exploring if you wish. We call at Sal², famous as Mussolinis last Republic after he had been captured by Italian partisans. However, we live in more peaceful times now, and there are some 15th century buildings and an art-rich cathedral to see before we continue our journey to the delightful Sirmione at the lakes southern tip. Today we also see lush groves of olives, citrus trees and of course vines used for making the famous Bardolino wines. Scenically the shore varies from the rich vegetation of the middle reaches, to the more rugged north covered with pine trees whose unmistakable scent hangs heavy in the air. Today we head north to the stunning Dolomite Mountains the result of geological activity some 230 million years ago, giving them a gorgeous pink and lime-green hue. The foothills are strikingly green pastures studded with the occasional small shepherds house, a few sheep and goats here and there with pine forests stretching into the distance. Autonomous since the 12th century, today you would believe you were in another country. The houses in the picturesque tiny hamlets resemble Swiss or Austrian style chalets, low with gently sloping roofs and enormous window boxes crammed with flowers of every imaginable colour. The people are different too, taller than Italians and speaking a dialect of German! We have plenty of stops today as well as the opportunity to ascend on a cable car (subject to seasonal operation) to enjoy panoramic views of the whole area. There are not enough words to describe the awesome splendour of this rugged landscape and its clean, crisp and invigorating mountain air  it really will take your breath away. Due to its remote situation, it is home to a huge amount of rare and unique wildlife, so if you are lucky you could see chamois, ibex and golden eagles and various deer. Today is a free day to explore at you leisure. Riva del Garda has been welcoming visitors since the 19th century and today the old town is a collection of typically Italian buildings painted the enticing pastel shades of cream, peach, magenta and ochre so reminiscent of Mediterranean countries. It has several harbours with boats rising and falling with the gentle waves and is dominated by a medieval fortress. 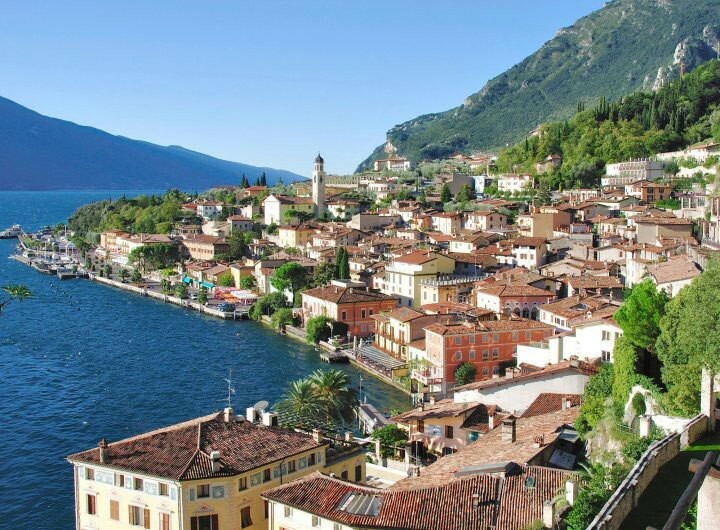 Nearby is a most attractive square, beautifully lined with pavement cafs which all blends together to make Riva one of the most attractive towns on the lake. After an early breakfast we take the drive to Venice, unique, caught in a time warp and as culturally rich as any city can be. We will take a walking tour during which we will see St Marks Square and its Basilica, the Campanile, Doges Palace together with countless other places of interest. Venice first came to prominence in the 10th century and grew in wealth and power on gaining its independence from Byzantium, reaching its zenith during the 15th century. It was then that many of the fantastic buildings you see today were built. Venice at the time was the greatest power in the Mediterranean with an empire encompassing Crete, parts of Turkey and a huge portion of Northern Italy and it soon created a capital to match. Situated between east and west, trading quickly grew and innumerable merchants made fortunes manifesting this new found wealth, just as people do today, in the arts and property, private and municipal. St. Marks Basilica is a must: built to house the relics of St. Mark himself, it is Europes most exotic cathedral with the decoration inside certainly being very opulent. The statistics are staggering  there are over 40,000 square feet of detailed mosaics of every colour of the rainbow covering the entire interior. The blend of coloured marble columns, gold and red painting, and bas-reliefs combine to create one of the worlds most beautiful buildings. Adjacent is the Doges Palace, home of the most powerful man in Venice who, incidentally, was elected for life. The Palace was also the seat of government councils and courts, as well as the prisons. Obviously the government of a great power had to be accommodated appropriately and so, as a visit will reveal, it houses the most amazing wood carvings and one room alone has four Tintorettos in it. The floor is a revelation too, inlaid with exotic woods from all over the known world from as far afield as Japan. The walls and ceilings are exquisitely decorated with paintings, frescoes and gold leaf. St. Marks Square is a must too, and the focal point of the city since its foundation. Today though, visitors have replaced merchants, and to sip a coffee in one of the pavement cafs and absorb the beauty around you must rank as one of lifes great pleasures. To see it all at once, why not take a trip up the Campanile, the imposing tower, originally built as a lighthouse and where Galileo demonstrated his telescope to a sceptical public. For art lovers there is Accademia, housing one of the finest collections in the world with superb examples of Renaissance work, or there is the Guggenheim with exhibits by Miro, Picasso, Chagall and Lger among others. One thing that really strikes you about Venice is that it is not nearly as expensive as you might believe. Away from St. Marks Square, small restaurants offer three course meals at reasonable prices. But Venice is not just art and monuments  fantastic though they are the city really needs to be seen from the water too, and what better than by taking a trip on a gondola. These beautifully made boats are crafted from 300 individual pieces of wood. A short ride on one of them is a lovely and peaceful way to explore the backwaters of the city. You will have sore feet when you return to the hotel but everyone at least once in their lives should visit this wondrous city. If you’ve been to Venice before, perhaps join us on our tour of ‘undiscovered’ Venice with a local guide and explore the less-visited places that are just as intriguing. See the Santa Maria della Piet church and the adjacent orphanage where Vivaldi taught music. Tucked away nearby is a modest Greek settlement, where we find the beautiful Greek Orthodox church with its classically Venetian exterior. A short walk takes us down the narrow alleys so typical of the city to Campo Santi Giovanni e Paolo, one of Venice’s most significant squares with several spectacular highlights: the imposing Dominican church here boasts even more impressive interiors, and the majestic Scuola Grande di San Marco houses many of Tintoretto’s masterpieces. Verona is one of the most beautiful and pleasant cities in Italy and today we have a guided walking tour in order to appreciate it at its best, discovering its hidden side too. We approach through the centuries-old city walls  when you enter the old town you cannot help but admire! Medieval pink-hued buildings complete with contrasting frescoes underneath archways unchanged for centuries. Typical pavement cafs abound, some with violinists serenading their clients whilst they take a refreshing drink, enjoying the shade from the warm sunshine. It has tiny narrow streets, complete with the tasteful shops, so typical of Italy, and then there is the market place dating from Roman times, with interesting reminders of the citys past. The tragic story of Romeo and Juliet is set in Verona and when you experience the atmosphere here you can see why. The two great lovers from rival families have inspired countless films, poems and dramas. You can actually see the balcony where the immortal words O Romeo, Romeo were reputedly spoken. The Roman arena is awe inspiring but there are also countless medieval and Renaissance squares and courtyards to explore, as well as a superb 12th century cathedral which houses a work by Titian. The Roman Theatre is a must too, as is one of the Renaissances finest gardens with clipped box hedges and a dazzling display of colour. Another interesting site is San Zeno  arguably the finest Romanesque church in northern Italy. One of the most delightful things about Verona is that although being close to Venice it receives fewer visitors. This afternoon is free so you can explore as you wish, or you could go shopping. Italy is inextricably linked with fashion, style and chic, and Verona has some lovely shops with prices not nearly as expensive as you may imagine, with leather ware being particularly good value. For those who have been to Verona before, our undiscovered tour is the best way of seeing a different side of this city, including many hidden cultural and architectural gems that most visitors never see.